The infamous Gunpowder plot - the doomed attempt to blow up the English Houses of Parliament and King James - is a fascinating episode of British history. Despite its huge significance, and reach into the popular culture of the day (where we still celebrate the delivery of the King every year by burning Guy Fawkes in effigy every November the fifth), most people only know the very bare bones of the events, and can probably only name one conspirator (Fawkes). This is partially due to the distance of years, the necessarily complex and secret nature of the plot and the various cover-ups, both the conspirators and the government of the day. In this excellent book, Antonia Fraser, one of our leading historical writers, sets out to uncover the roots of the plot, dating back the persecutions of Catholics in the reign of Elizabeth Tudor, describe how the plotters came together and brought their plans to fruition, delve into the mystery surrounding the uncovering of the plot and the roots of the Monteagle letter, and finally discusses the subsequent aftermath and the brutal fates of the plotters. The tale is very well researched, and an excellent attempt is made to present all the known facts of the case. In some of the more contentious areas, such as the authorship of the fateful Monteagle letter, some interesting and plausible conclusions are presented. The narrative is very clear. By necessity there are a huge number of people involved, Fraser's descriptions bring many of them to life, and she is so clear in her narration that I found I almost never lost track of who is who. 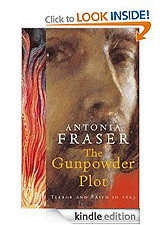 Even more interesting, Fraser draws several parallels with modern terrorism in Ireland, in which the struggle between Protestant and Catholic, central to the Gunpowder plot, is perpetuated even today. Antonia Fraser has once again through her brilliant story telling and thorough research achieved to shed light to one of the most exciting days celebrated by us on the 5th of November. However back in time it was no joyful merry making that led to such a plot. Sheer distrust towards the King and his false promises forced a group of men to extremes. As always Fraser makes you live the period with it's religious diplomacy and underlying angst of the common people. Antonia Fraser's lively and authoritative history not only provides an entertaining account of the events that have turned November 5th into an annual fireworks celebration but also throws a light on how to tackle terrorism. For the early seventeenth century world which spawned Guy Fawkes, Robert Catesby and an attempt to blow up Parliament was one in which there were widespread fears of plots and violence, motivated by differing religious views that led some (but not all) to see the future as inevitably bringing a violent confrontation for religious supremacy. Fears of terrorist conspiracy by an extremist minority in a religion that nominally owned obedience to an overseas religious figure all sounds rather contemporary. Fraser's skill in mixing the stories of individuals with the story of social tensions brings out the frequent difficulty in deciding quite who or what behaviour is beyond the pale. There was then a spectrum, with at one end a small number of Catholic extremists plotting violent treason but then moving on to those who supported the plot, even if they did not directly participate, those who knew of the plot and let it be, those who knew of the plot and privately tried to stop it (but did not call in the authorities), those who did not know of the plot but only by virtue of turning a blind eye and finally, those who knew of the plot and, probably, did tip off the authorities. Picking precisely where on that spectrum to draw legal culpability, especially in a world of imperfect evidence and conflicting accounts, is not easy and the existence of that spectrum means that successfully tackling the extremists at one end often means appealing to - rather than antagonising - those further along the spectrum. Aside from the strength of these modern parallels, the other aspect of the book which most surprised me was the role of women in keeping the Catholic religion going in England. The paucity of legal and property rights for women meant that they were, ironically, largely protected from the financial penalties levied on Catholics at the time. Therefore in many families the wife remained a Catholic, bringing up children (at least until adulthood) as Catholics too but with the husband and other adult men in the family paying obedience to the demands of Protestantism. At heart, however, is the well told story of the plotters, their attempts to blow up Parliament and the consequences for them and for many other Catholics. It is a good read, even without those other bonus perspectives.